Algeria’s economy is based on exports of oil, natural gas, and related products and is dominated by the state. The hydrocarbon sector is responsible for 30 percent of gross domestic product (GDP) and over 95 percent of export earnings. Algeria’s GDP amounted to USD 207.9 billion in 2012 (World Bank). And in the year 2015 the gross domestic product (GDP) decreased to 166.84 billion US dollars, in comparison with 213.52 billion dollars in 2014. The reason goes back to the decrease in the global oil prices. The International Monetary Fund predicts that the GDP will reach to 178.4 billion US dollars in 2017. As well it is predicted the GDP per capita in 2017 will reach to 4,295 dollars according to current prices. Growth had receded in the year 2015 to 2.9% in comparison with 3.8% in the year 2014. According to the MENA Economic Monitor, economic growth in Algeria will remain modest and may reach 3.4% in 2016. The international Monetary Fund points that the inflation rate in the year 2017 will reach 4.8%, in comparison with 5.9% in the year 2016. Its position as the sixth-largest gas exporter has in recent years generated foreign-currency reserves close to USD 200 billion. 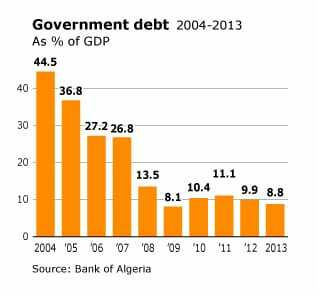 Consequently, Algeria’s status as a major indebted country has become a thing of the past, with a debt rate of 2 percent of GDP. The downsides of Algeria’s economic development are its structural inability to diversify beyond oil and gas and the persistence of social problems, in particular youth unemployment and the shortage of adequate housing. Large infrastructure programmes have been launched in recent years to address these issues and (re)build roads and railways. Under French rule and earlier, the Algerian economy was based on agriculture. The major products were crops destined for export to the colonial centre, such as grains and wine grapes. In addition, some light industry existed, mostly involving the processing of these products. All this began to change in 1956, when the first large oil fields were discovered at Hassi Messaoud and natural-gas fields were discovered at Hassi R’Mel. As a consequence, the economy of modern Algeria is dominated by the production of petroleum and, more importantly, natural gas. Even after decades of attempts to build a more balanced economy, the hydrocarbon sector still accounts for over 90 percent of export earnings. Despite massive investment in an integrated industrial structure, especially during the 1970s, Algeria has not succeeded in diversifying its economy significantly. Given this dependence, fluctuations in the world oil and gas markets have always had important effects on the country’s social and political development. Revenues from the international energy market enabled the state to guarantee the population a degree of welfare, at least for a while. Regionally, it allowed the Algerian state to project its power and enlarge its sphere of influence in the Maghreb, the broader Arab world, and the Sahel region. Globally, ‘oil power’ supported Algeria’s endeavours in the 1970s, together with like-minded countries, to change the global economic balance of power, but, as this power was based mainly on the export of a commodity dependent on Western demand, this attempt was less successful than that of the present BRIC countries, which are mostly commodity exporters. The overall liberalization of the economy in the 1990s has meant that the rules regarding foreign investment have been relaxed. The government looks for ways to stimulate foreign investment in the economy. At the same time, it has tried to strengthen the role of domestic capital through the obligation for foreign firms to enter into partnership with one or more Algerian counterparts, who must have at least a 51-percent ownership. The import business in many goods – ranging from specialized capital goods to keep industries operating to mass consumer goods and food staples – is a source of social and political power, and conflict. While the official channels are dominated by those who have the right political connections, the extensive black market offers a parallel import channel for the less privileged and creates a welcome avenue for the creation of jobs. The war of independence left the physical infrastructure of Algeria devastated. This was a large impediment to creating a functioning economy and a well-run nation-state. Building a new infrastructure has therefore became a priority in successive national development plans since the 1960s. In northern Algeria, the building of roads and rail lines has often lagged behind the growth of the population and internal migration from rural areas to the main cities. The industrialization drive of the 1970s only increased the need for an adequate infrastructure, especially roads, water supply, and a secure national electricity grid. The economic crisis of the 1980s and the following civil war meant a delay of many plans. The violence also resulted in the neglect or destruction of existing infrastructure. 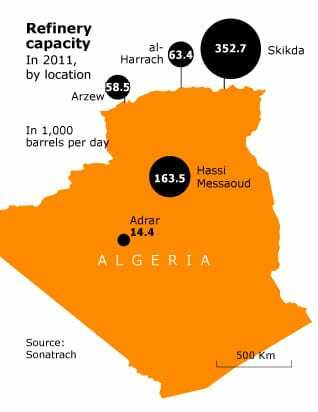 The position of Algeria in the global market is determined largely by its role as an exporter of natural gas and, to a lesser extent, petroleum products. The country is presently the eighth-largest exporter of natural gas, which is used mainly for electricity generation. Being close to several developed European economies that have few energy resources, it has always been in a favourable position compared to the Middle Eastern oil- and gas-producing countries. 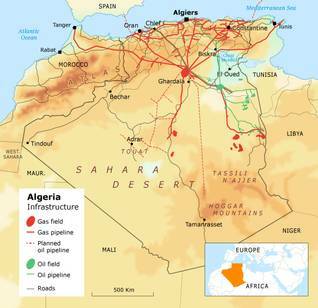 Although Algeria’s role in the international energy market represents a clear break with the colonial agricultural economy, the major economic exchanges still follow the earlier north-south routes. 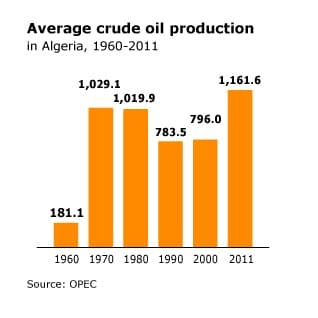 Since the end of the 1960s, when the demand for oil exceeded the supply, Algeria has pursued an assertive pricing policy. Besides the obvious economic motivations, this was also in line with its political differences with the West over the Israeli-Arab conflict, culminating in the oil embargo against several European countries in 1973. Usually, however, Algeria maintained a pragmatic attitude towards safeguarding the Western markets that are still the source of most of its revenue. The main buyers are energy companies in southern and western Europe, which are supplied by pipelines across the Mediterranean. The major transport networks link the Saharan gas fields – through Tunisia and Morocco as well as directly, via the Mediterranean – to the national networks of Spain and Italy. Algeria has also been a pioneer in the liquefaction of natural gas. This allowed the export, by tanker, of large quantities of liquified natural gas (LNG), especially in the trade with East Asian markets. Because of the increase in domestic consumption and its dwindling reserves, Algeria’s exports of crude oil have decreased to less than 700 barrels per day (bpd). 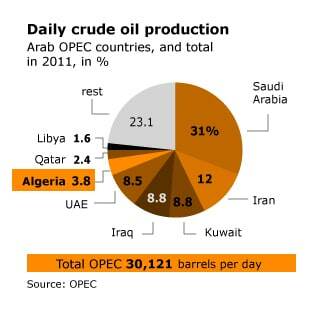 In comparison, other OPEC members such as Kuwait or Nigeria export some 2 million bpd. Its substantial crude-oil-refining and petrochemical-production capacities are now used mainly to serve consumers (including industry) in Algeria itself. Other export products are dates and limited amounts of wine. Algeria’s links to global markets are also determined by its need to buy abroad all the products that its industries and agricultural sector are unable to provide in sufficient quantities and/or with the desired quality. This is the case for basic foodstuffs, as well as upmarket consumer goods of global brands and many specialized products needed by industry. Major suppliers are European countries (France, Spain, and Italy), and China, Turkey, and other emerging economies. The economic links with the former colonial power are still considerable; Algeria is the major non-Western market for French products. Trade with neighbouring Morocco, Tunisia, and Libya has always been limited. The high expectations of Maghreb economic cooperation (resulting from political cooperation) in the decades preceding the end of French rule proved to be short-lived, once independence had actually been achieved. The oil-price slump of the 1980s, and, to a lesser extent, its domestic political reforms, motivated the Algerian leadership to look towards its neighbours. Economic complementarity between countries rich in resources (Algeria and Libya) and those producing more consumer goods (Morocco and Tunisia) made sense, but the conclusion of an economic cooperation agreement as part of the Greater Maghreb Union in 1989 proved largely symbolic. Most of the participants were more interested in negotiating preferential trade agreements with the European Union, as was the case for Algeria, which concluded an association agreement with the EU in 2005. Algeria is also involved in the global arms market. In the 1960s and 1970s, the Soviet Union was the main supplier of sophisticated weapon systems. In later decades, especially after the outbreak of civil war in the 1990s, the Algerian Armed Forces looked more towards France, the United States, and other Western countries for arms. As a major energy supplier to industry and consumers elsewhere in the world, Algeria is, in principle, able to produce all the energy it needs for its own development. Its refineries convert crude oil into products for use in transport, heating, cooking, and other applications. Natural gas is an important source of electricity for the national grid. The problems experienced with domestic energy supply over the years had to do mostly with the difficulties of expanding and maintaining the electricity transmission network. The grid is also fed by hydroelectric plants that have been built in mountainous areas such as Kabylia. The economic upturn in the first decade of the millennium resulted in an increase of demand for electricity by almost 50 percent. In the near future, solar energy will probably become more important. With a growing population and dwindling oil reserves, solar energy is attractive. Making use of this renewable source will free up more hydrocarbon products for export or the production of chemicals. Moreover, the wider application of solar energy could make a difference in tackling air pollution and limiting the emission of greenhouse gasses that contribute to global warming.
. The future of this challenging project, involving many companies and states, is not yet assured. Algerian industry has always been dominated by oil and natural gas in two ways. First, the hydrocarbon sector is by far the largest industrial sector. Second, the revenues generated by the export of oil, gas, and related products have been the main source of investment capital for other industries, along with huge loans from the international capital market that form a mortgage on those reserves. From the major production sites in the Sahara desert, oil and natural gas are transported to the Mediterranean coast. The industrial areas surrounding major cities such as Algiers, Oran, and Annaba are home to huge refineries and petrochemical complexes and plants for the liquefication of natural gas that is transported in tankers to foreign markets. As the main entity responsible for the oil and gas sector, the state oil company SONATRACH (Société Nationale pour la Recherche, la Production, le Transport, la Transformation, et la Commercialisation des Hydrocarbures, National Company for the Exploration, Production, Transport, Transformation, and Commercialization of Hydrocarbons) is often considered a state within the state. After its foundation in 1963, it grew in size and significance with the nationalization of foreign oil interests in the following decade. The 120,000-strong workforce operates the entire production chain, from exploration to consumer sales. The decentralization of certain parts of the company and the increasing cooperation with foreign oil firms have not substantially changed the position of SONATRACH as a power centre. This is reinforced by the interlinking and exchange of personnel with other parts of the state apparatus, especially the Oil and Energy Ministry. In the 1970s, the government invested billions of petrodollars (and money borrowed on the international markets) in the construction of heavy industries, especially the steel industry, supplied by Algerian iron-ore deposits. Together with other basic industries (e.g., cement plants), steel mills were meant to be the basis of extensive industrial development and provide inputs to light industries producing consumer goods. This approach of ‘industrializing industries’ did not work out as planned, due in part to political factors inherent in the rentier economy. Many industries remained inefficient and appeared to be generators of jobs for the regime’s constituency of workers and managers and the bureaucracy at the ministries in charge. With shrinking resources and increased foreign debt, the restructuring and ultimate privatization of part of the industrial sector seemed inevitable. In the 1980s, many large state enterprises were divided. A decade later, the emphasis shifted to a policy of attracting foreign investment in the Algerian industrial sectors. This policy was not pursued to its full extent, as some activities were still considered to be of strategic interest to the state. More importantly, the structural deficits and inefficiencies that had plagued many enterprises in the state sector discouraged foreign companies from investing, as did the civil war. After 1999, the apparent stabilization of the political and security situations and the beginning of a new era of rising oil and gas revenues began to change this picture. As a result, the emblematic steel complex at al-Hajar went into the hands of the Indian Arcelor Mittal group. Increased opportunities for foreign investment also led to the French company Renault producing cars in Algeria. Negotiations and other preparations moved slowly, but the fact that two-thirds of Algerian cars are produced in France provided sufficient motivation. Light industry is more diversified and has always involved greater private entrepreneurship. As with heavy industry, most factories are found near the main urban centres in the north, although the decentralization of the 1980s has also led to the creation of more light industry in the increasingly populous centres of the High Plateaux and some oasis towns. The light industrial sector comprises the processing of food and the manufacture of household appliances and some luxury items. In many cases, though, consumers prefer imported goods that bring higher social status. The increase of public spending thanks to increased oil and natural gas revenues has favoured the construction sector. The government’s programmes for the renewal of the physical infrastructure have led to the building of new motorways and public-transport facilities, such as railroads and urban tramways, as has the programme for addressing the housing deficit. New schools and other public buildings, including the megaproject of the Great Mosque of Algiers, also are to be built. Much of the construction is carried out by foreign firms, from other Arab countries (such as Lebanon and the Gulf states) and Europe, as well as China and Turkey (which built new apartment blocks in the suburbs of the main cities). 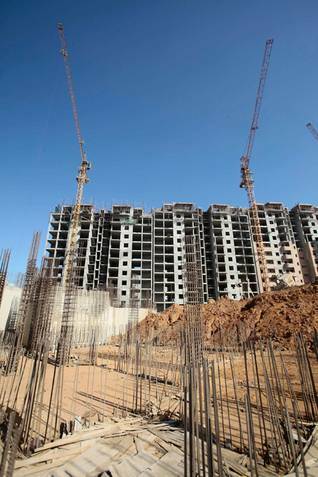 All foreign firms are obliged to enter joint ventures with Algerian construction companies. The development of this sector is expected to continue, as there is a continuing need for new houses and the government’s programme for infrastructure investment is not complete. Like most other economic activities, however, the construction sector is strongly dependent on the state’s continued investment, which, in turn, depends on developments in the international energy markets. As in ancient times, grain is still a main product, together with citrus fruits and dates. After the war of independence and the departure of the colonists, the colonial agriculture system had largely collapsed. Algerian labourers kept the enterprises going as best as they could; this later became the basis of the official policy of ‘self-managed’ farms. Under President Houari Boumedienne (1965-1978), these experiments were brought under government control. In order to increase food production, the government launched an agricultural revolution in the 1970s. 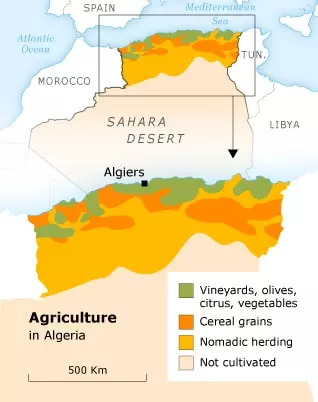 Although more resources became available over the years, thanks to growing economic prosperity, the agricultural sector lagged far behind the growing industries and was unable to supply the Algerian urban population with sufficient basic foodstuffs. In order to close the gap between supply and demand, the country remained largely dependent on imports, which only aggravated the trade deficit. In recent years, the situation has improved; the Ministry of Agriculture even claims that over 70 percent of all food crops are grown domestically. Despite the modernization efforts, agriculture is still very dependent on rainfall, which may fluctuate strongly from year to year. Insufficient or inferior inputs, such as fertilizers and seeds, together with bureaucratic practices, produce less than optimal results. Algeria is famous for the quality of its oasis-grown dates, which are the major export product, after oil and natural gas. The main market for the Deglet Nour variety, grown mainly in Algeria and Tunisia, is southern Europe. In the first decades of the independent state, the government maintained tight control over the banking sector. With the partial liberalization of the economy in the 1990s, the private sector, both foreign and domestic, was given more freedom. The number of banks has increased from five to more than 25 over the last twenty years. In practice, the state is still very influential in the financial sector, through the central bank upon which the entire sector is very dependent. Domestic trade has always been important in the private sector, despite the substantial role of state firms in retail. The state long maintained formal control of all foreign trade, which was deemed an essential sector. In the 1990s this monopoly was abolished, paving the way for private actors to trade with the outside world. Administrative rules were loosened, and the dinar became freely convertible for foreign transactions. This has not diminished the influence of the state, however, especially because many import and export businesses are run by people with close connections to the state apparatus. Algeria has a huge, largely unfulfilled potential for tourism. Unlike neighbouring Morocco and Tunisia, it has never invested in large-scale holiday complexes aimed at international tourists. The beginning of mass tourism coincided with the oil boom, which made it less urgent for the country to resort to this potential source of income. It is thus mainly Algerian holidaymakers and migrant families who visit most tourist sites. There have always been smaller numbers of European and American travellers who sought to discover this little-known country. In particular, the Sahara desert attracted foreigners to places such as Tamanrasset and the Hoggar Mountains, the Tassili n’Ajjer, and Timimoun. Some of them also negotiated the desert roads in second-hand European cars sold in West Africa. In the 1990s, the worsening security situation in Algeria and in the Sahelian countries to the south, put an end to most of this adventure tourism, But even in the darkest days of the civil war of the 1990s, a few (mainly French) tourists flew to Tamanrasset to make desert trips. Other main attractions include the Roman remains at Timgad, Tipaza, and Djémila, and the old parts of the cities, such as the Kasbah of Algiers. Since the end of the civil war, the number of foreign tourists remains dependent on the news and subsequent perceptions of risk. In recent years, the activities of surviving armed groups and the unrest in neighbouring Libya and Mali have frightened people away, after incidents such as kidnappings. The 2013 attack on the In Amenas gas complex, although not near any tourist site, only confirmed this negative perception. The dominant hydrocarbon-based industries have not created enough jobs. They are mostly high-technological ventures that require few workers. The light industries and formal trade sector have also been unable to absorb the many entrants into the labour market. At the same time, there has been a structural lack of consumer goods made in Algeria, while imported goods are often more expensive or less available. Before the 1990s, the import restrictions imposed by the state only aggravated this situation. For these reasons, an important black market developed early in the history of independent Algeria. The state’s formal monopoly on foreign trade was belied by widespread illegal trafficking in goods. The informal economy is estimated to employ about 40 percent of the Algerian labour force. This includes transactions involving not only consumer goods but also industrial inputs for medium and small-scale enterprises. The informal sector has always run parallel to – and is, in fact, integrated into – the formal, state-dominated economy, as goods flow in both directions. Outputs of state firms sometimes follow remarkable paths before turning up as inputs into other economic activities. The informal economy affects a variety of economic sectors, including construction and agriculture, as industrial outputs are not channelled into formal activities and prices are undercut by illegal imports. The existence of the black market is no secret to the state, and its role has often been acknowledged by government officials. They do have reasons to live with it, even if its eradication were possible. The existence of a large informal sector may disadvantage the state in tax revenues, but it also lessens the state’s responsibility for the creation of jobs and for the supply of consumer goods. This state of affairs probably detracts from the credibility and legitimacy of the government. The dominance of the hydrocarbon industry and the earlier emphasis on heavy industrialization has typically favoured a centralized economic infrastructure. Most industries are concentrated in major urban centres in the north, where the oil and natural gas pipelines from the desert end in refineries, petrochemical plants, and shipping terminals. Most other industry is based there as well. In order to redress the balance, government policies since the 1980s have aimed to create new centres of industrial development in the cities of the Hauts Plateaux and some Saharan towns. These efforts have been partially successful. In addition, a large network of regional airports was developed that facilitated transactions between the economic core and the regional centres. The government’s regional development strategy included the promotion of agriculture in more remote and especially more arid areas that were not traditionally the main producing regions. In line with the generally disadvantaged position of agriculture and rural development relative to other economic activities, these initiatives did not initially get off the ground. In 2005, a new plan was launched that combined job creation in outlying rural areas with sustainable forms of agriculture and the preservation of the rural environment, including local culture. Thanks to developments in education, Algeria has a relatively skilled population. Despite restructuring and budget cuts, the state is still a major employer. Many people work in state firms and in government administration. The private sector offers many jobs in small and medium enterprises, but these provide employees fewer certainties. The official employment sectors are unable to absorb those who enter the labour market each year, in addition to the many unemployed, so many attempt to find employment in the informal sector. 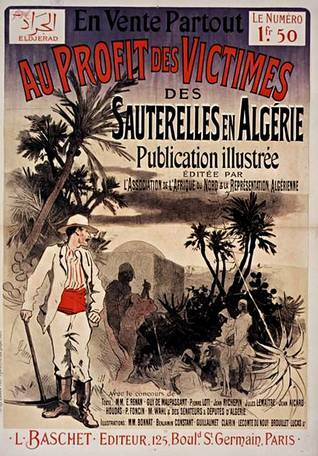 Since colonial times, many Algerian workers have lived in France and other European countries. They provided inexpensive labour in the industrial sector and, after World War II, helped rebuild the European economies. At present, about 1.5 million Algerians live in France, not including the Algerian Jews and their descendants nor the harkis (former Algerian soldiers in the French army and their families). There are also many pieds noirs (former colonists) and their descendants living in France. In total, some 4 million people living in France have some sort of link to Algeria. Since the time of the economic crisis of the 1980s and the civil war in the following decade, many Algerians have moved abroad to find new opportunities. Finding a better life has been difficult, though, given the state of the European economies and the restrictions on immigration in many Western countries. Few migrants succeed in obtaining work permits and starting a new life overseas, and many are stuck in the informal labour economy. Beginning during the oil boom of the 1970s, labourers have immigrated to Algeria, although not on a scale comparable to neighbouring Libya or the Gulf countries. Personnel from European, American, and, later, Chinese firms that were active in construction of industrial plants, houses, and other infrastructure settled in Algeria. In recent years, migrants from West Africa have come to Algeria in the hope of transiting to Europe. Because of the strict immigration policies in the European Union, some of these migrants have remained in Algeria and tried to find employment there.